Become the Ultimate Colonial Tycoon! Today Ape Apps is pleased to announce our first new release of 2018: Colonial Tycoon! Colonial Tycoon is based on the core engine of My Business Empire and set in the universe of My Colony. The year is 2060 and you are one of the first colonists on the Red Planet. Some people are moving there to start a new life. Some for political and religious freedom. You are moving there to get rich! Start out with a handful of cash and grow your business, employing wise money management tactics along the way. Unlock new technologies and licenses which allow you to expand your business like never before! Ever since My Colony came out in the summer of 2016, people have been asking me to turn it into an "idle" game, one that runs in the background and collects resources while you are away. Now, this is something that is never going to happen, for the simple reason that it would completely change the mechanics of the game. It got me thinking though. 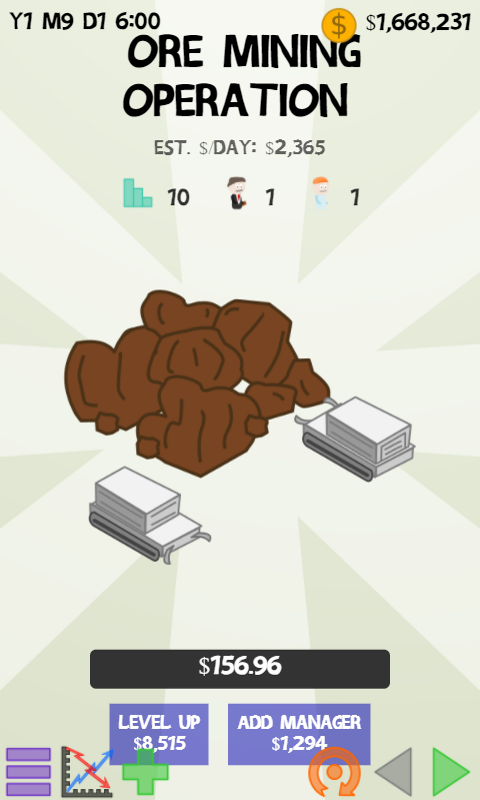 I do already have an idle money-making simulation game called My Business Empire. Why not build off of that code and make a My Colony themed idle money maker? And thus, Colonial Tycoon was born. While Colonial Tycoon reuses much of the core My Business Empire code, it also expands on the engine by adding a new technology upgrade feature, similar to the tech upgrades present in My Colony. New techs can lead to the unlocking of new buildings, and vice versa. This adds a fun new element and challenge to the standard money collecting gameplay found in the original My Business Empire. In addition to the new technology unlocking features, the core engine recieved various bug fixes and performance improvements, which will ultimately be making their way back into the original My Business Empire title. Much like the dynamic between My Colony and Antiquitas, updates to one game will directly impact and improve the other, speeding up the development for both and creating a win-win situation for the everybody involved.